Snapdeal Chief Product Officer Anand Chandasekharan has quit the company. This was announced by Snapdeal co-founder Rohit Bansal on Twitter. @rohitkbansal thanks for the support. We did in 1 what would take 3 years anywhere. Incredible passion @snapdeal. Best still to come! Chandrasekaran had joined Snapdeal in June last year after stints with Airtel and Yahoo. He’d been at the helm of Snapdeal’s product launches, including its Lite mobile site and its image search feature, SnapSearch. 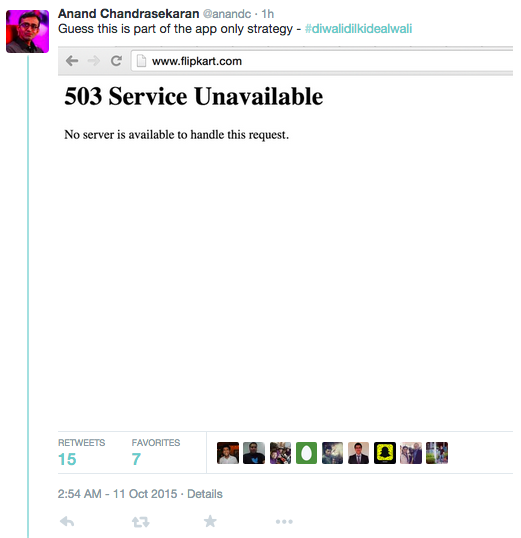 On Twitter, Chandrasekaran had been a vocal evangelist of Snapdeal’s products. He’d famously sparred with Punit Soni, CPO of Snapdeal’s rival Flipkart, over Flipkart’s site crashing during its app-only days. Interestingly, Soni had quit Flipkart last month. At the moment, it’s unclear what’s behind Chandrasekaran’s move. We’ll update this article as we have more information.